Remember that wonder product I was talking about in my last post (here)? I'm ready to divulge: it's the Overnight Detox Oil from Caudalie's Polyphenol C15 range. I got this little MyAntiOx kit filled with products of the Caudalie Polyphenol C15 range to celebrate their new AntiOx campaign. I got the Broad Spectrum SPF20 Anti-Wrinkle Protect Fluid (there is also a cream version for dry skin types) along with the Anti-Wrinkle Eye & Lip Cream and I must say that all three products are pretty much amazing! I try out quite some skin care and while often things are just fine but don't really cause a remarkable change in my skin, occasionally new products turn out to be true gems I know I will repurchase in the future. Like these! Although this line launched last year, I had never tried these products. I do buy Caudalie products (my favourite product I've been repurchasing is their Vinosource S.O.S. Thirst Quenching Serum), but since this is an anti-ageing line I wouldn't have ventured into these immediately. While this range is targeted towards ladies in their early thirties (I'm turning 28 this Summer), I find that it's not too heavy at all and perfect for my skin. The range is created to fight oxidation and wrinkles with a stabilised combination of Caudalie's grape seed Polyphenols and vitamin C that'll block free radicals caused by oxidation. Oxidation is a natural chemical reaction that produces free radicals: unstable molecules that have lost an electron and are seeking to take one from another molecule. They attach to our cells to do so and this is the cause of most wrinkles, loss of hyaluronic acid and a dull complexion. The formula is also enriched with hyaluronic acid, which will plump and quench your skin in an instant. The Anti-Wrinkle Protect Fluid is perfect for my type of skin that can turn oily on my t-zone, but it still feels dehydrated. It sinks into my skin quickly and my skin immediately feels quenched thanks to the hyaluronic acid in the formula. The Eye & Lip Cream -which I've tried using on the lips too but I like it for the eyes the most- has pretty much the same effect. Apart from a powerful concentration of polyphenols, it also contains anti-ageing ingredient Matrixyl 3000. It has an immediate hydrating effect & in the long run also targets fine lines, wrinkles and dark circles. Do take that dark circle thing with a grain of salt though: mine are hereditary and sadly aren't helped 100% by products. Finally the Overnight Detox Oil helps to renew and protect your skin while you sleep. It's infused with anti-oxidant grape seed, regenerating rose hip, purifying neroli, soothing lavender and detoxifying carrot oils. My skin glows in the morning after applying this and has been looking so much more radiant with frequent use. I have tried quite a few night oils and this is by far the best one I've ever tried! My favourite part of all of this might be how affordable this range is compared to how powerful it is. 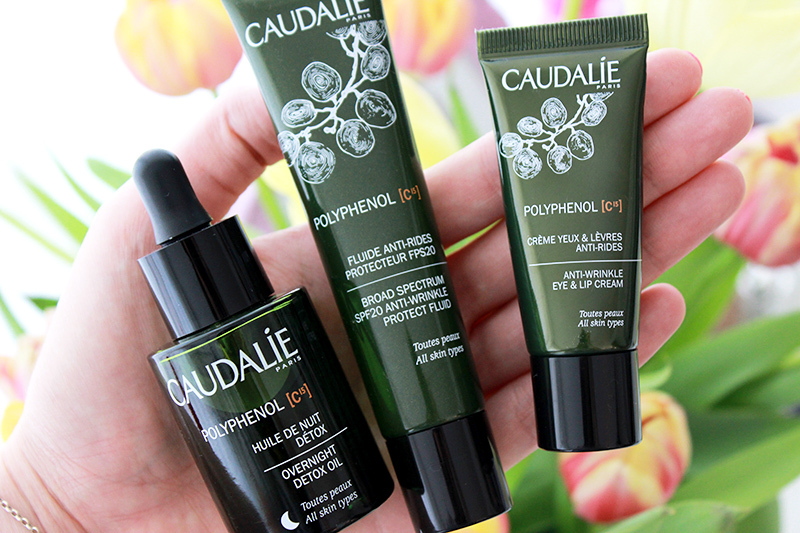 Caudalie is one of those brands that has a consistent quality to their products and has quite a few different lines that all have a different price range. You have the ultimate quality Premier Cru range that can be too pricey for the majority of shoppers, but next to that there's other very qualitative products like these Polyphenol C15 products that are much more budget friendly. Yep, I'm a big fan! You can currently also try and win a MyAntiOx Box on the Caudalie website!